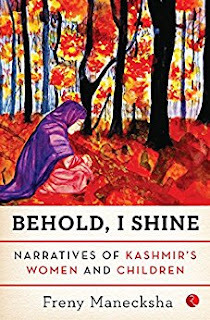 Set in the once-fabled land of Kashmir, Behold, I Shine moves beyond male voices and focuses, instead, on what the struggle means for the Valley’s women and children—those whose husbands remain untraceable; whose mothers are half-widows; those who have confronted the wrath of ‘Ikhwanis’, or the scrutiny of men in uniform, and what it means to stand up to it all. This book also brings to focus the resilience of the Valley’s women and children—of activists like Parveena Ahangar and Anjum Zamrud Habib, who, after debilitating losses, start human rights organizations; of ordinary homemakers like Munawara who have taken on the judiciary; and of a young generation of thinkers like Uzma Falak and Essar Batool who foreground the interaction of gender, politics and religion, and won’t let Kashmir forget. Stitching together their narratives, Behold, I Shine not only memorializes women’s voices—thus far forgotten, unwritten, suppressed or sidelined—but also celebrates the mighty spirit of the Valley. Freny Manecksha is an independent journalist, published in Himal Southasian and The Times of India: Crest Edition, among other publications, who has reported extensively from Kashmir, covering human rights and development issues. She has also worked with The Times of India and The Indian Express. Freny lives in Mumbai. This was one book that gave me sleepless nights. 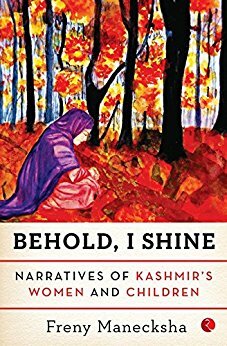 No, it isn't scary in the horror way but it is scary because it is the harsh reality of our country which we have been ignoring since so many years.Bringing together real life experiences of women and children in Kashmir, the author has tied them with a thread of hope, grit and determination. There were some stories that literally gave me goosebumps and I had to stop reading them for a while just because I feared I would break down. The voices are so poignant, they leave a lump in your throat. These stories not only talk about the horrors people living in Kashmir have gone through since so many years, but it also talks about how they decided to do something about it. I firmly believe in the saying " Be the change you want to see in the world." Here there are so many women who are striving to be the change they want to see around them. They are trying hard to create a world which is peaceful and devoid of any hatred for the generations to come by. You might wonder what is the main theme of this book. It is not highlighting the issues faced in Kashmir, neither does it talk about the support or perhaps the absence of it from all around. It talks about sheer determination, it talks about strength, about love, belief and most importantly the zeal to lead a better life. Darwin's theory of survival of the fittest is aptly displayed in these pages. Their stories are inspiring and moving at the same time. Through a narrative which is heartwarming the author makes you look at life, as they see it. The best part of the book was the liberal use of local words making it as close to reality as it could get. Read this book not to understand the issue better but to know how in times of adversity the true strength of a human is revealed. I truly admire the women who are fighting against all odds for a decent survival while many of us are taking our lives for granted. I am sure this book sets tone for many people who like me wonder what's happening there and most importantly what are we, the women of the nation doing about it. This book is an ode to woman's power and magical ability to change the world through nothing but her belief and untiring efforts. Hats off to all the women! Strongly recommended for all book lovers. As a woman you will smile as you gather strength from these women and their stories. As a man this will inspire you to keep fighting in life and never give up. As youth it will motivate you to be the change you want to see in the world. In short,this book is an altogether different experience in itself, one that will stay with me for long. 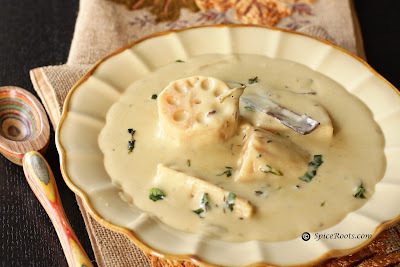 This book is like Nadir Yakhin – Lotus Roots in a yogurt sauce (Kashmiri Delicacy) - unique, tender and delectable flavours that stay with you long after you are done eating.